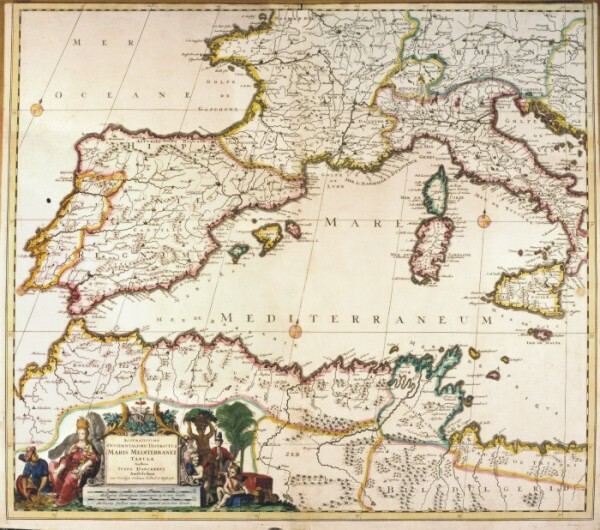 Description: This map, measuring 49,6 x 57,2 cm and drawn by Iusto Danckerts, was printed in 1710 in Amsterdam. 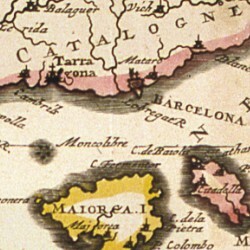 It shows the Western Mediterranean basin, from the Strait of Gibraltar to Calabria. The title and the graphic scales in Milliaria Germanica Communia 15 in uno Gradu and Milliaria Gallica sive horae itinersi 20 in uno Gradu, are included in a sumptuous picture, surrounded by human figures and trees. The mountains are indicated by mole-hill reliefs and the towns are drawn with small perspective designs.